It is being construed that Prime Minister Atal Bihari Vajpayee played a masterstroke as far as destroying the newfound opposition unity is concerned by proposing the candidature of Dr A P J Abdul Kalam. Yes, in terms of the objective of breaking the unity of the opposition they have succeeded. This is the tragedy of India, that the intrinsic ability and competence of the person does not determine the choice of the presidential candidate but whether he will be able to break the opposition unity. That is indeed tragic. Bad times have come to the country because the deterrent is the custodian of the Indian Constitution. And as the custodian of the Indian Constitution, he'll have to discharge many important responsibilities. Unfortunately all those are facts stated for what I'll call politicking in terms of breaking Opposition unity. When did you know that in the electoral college you stand nowhere with Mulayam Singh Yadav, the Congress and the entire NDA coalition flocking behind Kalam? We are in the electoral fray precisely to make a political point, that the election to the President of India is a political election. 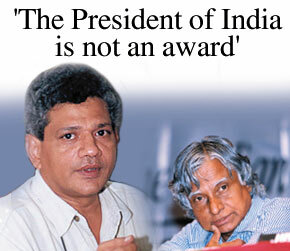 The President of India is not an award that is given because of your achievements. For that you have the national honour. Dr Kalam has got the Bharat Ratna. The President of India is the highest political executive of the country. And the power of the Union executive rests with the President as well as the supreme command of the armed forces. Now you require a person who'll be able to decide these issues. Secondly, as we are completely opposed to the BJP-NDA policies, in all terms, particularly in their attempt to communalise society and create a serious situation for undermining India's secular democratic polity. We cannot be opposing their policies and supporting a candidate proposed by them. Dr Kalam is a BJP-NDA nominee and it is politically untenable for anybody, forget us, to oppose their policies but support their candidate. From your statement it seems you are fielding a candidate only to oppose the NDA nominee. Secondly, you feel Dr Kalam will prove a misfit. Both! We want to bring back, through the campaign, the entire issue of the BJP's culpability in Gujarat. Till date the country and the people do not know what is Dr Kalam's stand on Gujarat. By putting up a person from the minority community as its candidate the BJP and the RSS wish to whitewash their role in Gujarat. That cannot go uncontested. There cannot be a consensus on the Gujarat carnage. That will be the issue before the people in this election. The second thing is, as supreme commander of the armed forces, the author of India's missile programme, they are advancing their entire concept of what we call militant nationalism. It is nothing but fascistic jingoism. And they want to advance that prospect. So whitewashing Gujarat, advancing their brand of nationalism, that is what they want to achieve through Dr Kalam. So, their putting up Dr Kalam is not an innocent gesture. They succeeded in breaking the opposition unity as well as in trying to push in their agenda. And it is that agenda that we are opposed to. We want the Indian public, irrespective of our winning or losing, to at least focus on these issues. Otherwise they'll feel free to go ahead and do precisely what they want to. So it means you want to use the opportunity to launch a countrywide debate? Precisely! We will utilise this opportunity to launch a countrywide debate and Dr Kalam will have to take positions. And through this debate what would you like to expose? The policies of the BJP and the NDA. And therefore an appeal will be made to all of them. Because this is not a vote on party whip. But even if this not a vote to be abided by party whip it is least expected that many of the legislators, who constitute the large electoral college, would defy the party line. In such a scenario you still think you'll be able to turn the tables on Kalam? Precisely for the reason that the opposition is for the opposition. And if you are opposing the policies and supporting the candidate, I think it is politically untenable. What is so special about Colonel Dr Laxmi Sehgal? She represents the tradition in India, which really fought for the country's freedom. A tradition that is totally absent with the BJP and the RSS. And today, they as custodians of the nation, they are destroying the very modern India, which the generation of Dr Laxmi Sehgal built, by their [BJP, RSS] communal politics. So by nominating Dr Sehgal we are focusing on the choice of India that we all want and have wanted through this long arduous struggle. Laxmi Sehgal symbolises that concept of a modern vibrant India, the secular democratic India; these forces want to replace it by a theocratic, religious intolerant State. But these are things which have not been clarified so minutely by the Left Front except for saying that the post of President should be filled by a person who is familiar with the complexities of the political situation in the country. Now with all the logic that you served, do you think Laxmi Sehgal fits the bill? Of course she'll fit the bill most adequately! Because she has not only been a freedom fighter, but after that she has also been a social crusader. And even today, even at this age, she continuously goes into the areas of the working people, the slums etc, doing service for them. She is politically active and vigilant. We think she'll better understand the political nuances taking place today. She will be better suited and more competent to actually discharge the presidential responsibilities. The parting of ways of the Samajwadi Party with the Left Front is being interpreted as fortunate or unfortunate by the Left parties, given the reports that Mulayam Singh Yadav had been creating hurdles in many decisions of the erstwhile People's Front. It's unfortunate that the People's Front broke up. But then in another sense it also opens up possibilities for a much broader and a more resolute alternate that we wish to build in the country. But do you now feel relieved that Mulayam Singh has finally bid you good bye? Whether relieved or not, it is a reality now. And the fact is that on a number of occasions, in the past as well, we have seen their [the SP's] proclivity towards the BJP on specific issue like corruption of the finance minister in the Flex Industry controversy when all of us were protesting against it. On an earlier occasion in 1998-99, when the Vajpayee-government had lost the no-confidence motion by one vote, an alternative government could have been formed. So we had these problems, but at the same time we also recognise that they are a major force, an anti-communal force in Uttar Pradesh. So we tried our best to take them along with the rest of the secular formations, but they had their own priorities obviously. With the Congress also parting ways, how does it affect opposition unity? What can we say about the Congress party? It's not the ruling party and it's behaving not even as an opposition party. So it's got to decide for itself what it's going to be. SP general secretary Amar Singh alleges that it is the Left Front that ditched his party? Ditched his party on what? Ridiculous! See, the Left can never support a nominee of the BJP-NDA. We think this is a political battle. We ditched them in the sense that we did not support the BJP candidate and that is our policy and that is their politics as well. The Congress party justifies its parting of ways with the Left on the issue of supporting the candidature of Kalam with its chief spokesman saying, "We do not think our relationship with Left parties will be adversely affected as it is based on ideological like-mindedness and their support to Kalam was a result of circumstances." How do you react? We have never understood what the circumstances were till now. What the Congress says are circumstances, they'll have to be a little more explicit as to what are these circumstances. For us the circumstances are clear that Dr Kalam has been proposed by the BJP-NDA. And it is also absolutely untrue that there was no possibility of a consensus. There was a consensus that was evolving on Krishna Kant. But the BJP broke that consensus by fielding Dr P C Alexander. It's only when they saw the opposition uniting against P C Alexander in favour of K R Narayanan that they panicked and brought Dr Kalam. So the whole game of bringing in Dr Kalam was not so much as though of a first choice or the intrinsic merit. The whole game was to divide the opposition unity in which they succeeded. Even then Dr Kalam is not being projected as a candidate of all those who are now supporting him. He seems to be a BJP-NDA nominee. So would you say that the polity has been reduced to two blocks, the Left and the non-Left (BJP-NDA, Congress and Samajwadi Party)? That is up to the Congress and the Samajwadi Party and other parties to decide where they stand. If they want to go and couch out to the BJP, to its policies and its programmes. Then let them decide where they stand. We are clear and categorical that we completely disagree with the policies and programmes of the BJP-NDA. There cannot be any compromise either on those policies and programmes or on the candidature they propose. You have also fielded candidates in the past. Can you recall what purpose that served? Of course we did. The Left has always fought these elections in order to put before the people of the country and the electoral college what we consider to be the most important issues. An election is a medium to take issues to the people. That is precisely what we shall do now. Even though there is an electoral college for the presidential election, the issues will be publicly debated, publicly raised. The issues cannot be brushed under the carpet by saying that some eminent person is there, therefore let there be no contest. The Congress also argues that by not supporting Kalam they would have forced Kalam into the lap of the BJP-NDA. Your comments. That doesn't do justice to their own assessment of Kalam's stature and integrity. If on the one hand you are saying he is such an eminent person that we should support him and on the other hand saying that if we don't support him, he'll fall into the lap of the BJP -- then you are not thinking very highly of him. He still continues to be a BJP-NDA nominee. He is still their man. This is obviously a misnomer, not to say that he is not their man. He is already with them. So there is no question of pushing him in any way. What is your election strategy? We will conduct this campaign. We'll have our candidate go to all the state capitals, meeting people. And publicly we want to raise many of these issues, particularly Gujarat, on communalism, Centre-state relations. These are the areas where the President has an important role. These are some of the issues we want to raise and their candidate will also have to answer. It has been reported that Dr Kalam being a nuclear scientist is also one reason for your opposition to his candidature? What we are saying is that he is an important person involved in India's missile programme. Now to send such a person to Rashtrapati Bhavan also sends a signal all over the world. On the one hand you say you are de-escalating on the border under pressure from the United States. On the other hand you are sending a hawkish message by saying this is the kind of candidate we have. Our opposition is not to anything Dr Kalam has done or what has been his work. Our opposition is not to Dr Kalam personally, but to the fact that he is the BJP-NDA nominee.